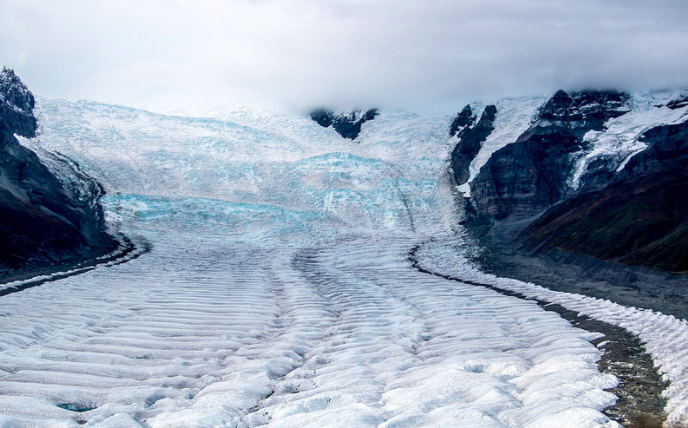 Seth B's Alaska journeys continue with the largest of America's 59 National Parks: Wrangell St-Elias! It is 13.2 Million Acres. To put into perspective that is the same size of Yellowstone, Yosemite, and Switzerland combined. Nice fun fact National Park Service! Check out Seth on Flicker HERE and Instagram HERE and enjoy his photographic journey through another one of Alaska's amazing National Parks! Wrangell–St. Elias National Park and Preserve is the largest U.S. National Park. At 13.2 million acres (20,650 square miles) it is larger than some countries, including Costa Rica & Switzerland. Most of the park is wilderness. Four mountain ranges meet in the park, which include 9 of the 16 highest peaks in the United States. Getting anywhere inside the park is its own adventure. I decided to visit the Kennecott Mines and National Historic Landmark area of the park. While there is a 'road', or 60 mile covered over abandoned railroad track leading to the area, I thought it would be best to leave the rental car behind for this one at the ‘airport’ and enjoy the scenery from above. When I arrived at the Chitina airport parking lot, I soon realized the parking lot was also the airport runway. No TSA for these flights! No anything for that matter, as we casually awaited for signs of life to emerge from the clouds. As my friend and I joked about the two small aircraft that looked in questionable condition and tied to the ground, probably so they didn’t blow away in the wind, a similarly sized aircraft finally made its approach. The small plane meant a lower altitude and that made for an enjoyable flight from Chitina to McCarthy. It’s a lot more personable when you get to converse with the pilot, and our pilot ended up being really great. He took us over some lakes, rivers, flew by some old mining buildings in the mountains, and then we flew up close to a glacier before landing at the end of the 'road' in McCarthy. From here there is a few miles of potholes that lead to the once upon a time ghost town of Kennecott. I stayed at the Kennecott Glacier Lodge right in the old town. This was the only place to stay in the old town, but it's also probably the best National Park lodge I’ve stayed at in terms of service and location. Step outside and you're just moments away from putting on your crampons and climbing on a glacier, visiting an ice cave, or hiking miles of wilderness & mountains. 16,390’ Mount Blackburn crowns the surround mountain range. All meals were included with your stay at the lodge and they are served family style. This made for some interesting dinner conversations and mingling with the other guests who were traveling from all around the world. The town of Kennecott opened in 1911 and operated as a copper mine in the hills above & mill in the town below. Here they extracted at least $200 million worth in copper ore (equivalent to over $3 billion today). 196 miles of railway were required to move the copper ore out of the area to the closest town. At the peak of Kennecott’s success it employed about 600 workers in the mines & mill town. There were nearly 70 miles of interconnecting mining tunnels. In 1938 the mill and mines, with no warning to its workings, closed after the owners no longer found it to be profitable. Kennecott was left abandoned. In 1998, the National Park Service acquired many of the significant buildings and lands. Here the ruins of this old town have come back to life with those who make the journey into this forgotten time. Kennecott is reputedly still the tallest wooden structure in North America. There are a few guides available and conveniently located right outside the lodge. They offer numerous ways for exploring the area and will cater to your physical conditioning. (Glacier hikes, ice climbing, ice caving, river rafting). I went with St. Elias Alpine Guides and was very pleased with our knowledgeable guides. We were able to get one of the last tours of the old mill which was closing for the next 2 years in efforts to stabilize the structure. The mill is a remarkable 14-story wooden structure. We entered from the top floor and worked our way down. From the top of the mill you can see the rest of the old town. Some buildings have been restored and others are beyond saving and collapsing into ruins. Walking through the mill & old ghost town was like traveling back in time to a different era. The following day we did a full day glacier hike with a guide. Hiking with crampons on the ice is a really fun experience. You can climb some steep hills in crampons that you would not be able to walk on normally. We hiked and climbed roughly 10 miles on two different glaciers. We also stood on the edge of some moulins, aka crevasses, and peered into the abyss. On our lunch break our guide took a piece of glacier and heated it up to make apple cider/coffee, a pleasant refreshment. At the end, our guide took us into an ice cave. At the mouth of the cave it seemed rather dark and dull, but as soon as you entered the cave instantly glowed an amazing crystal blue. I could have easily spent more days here exploring just this area of the park. There are lots of old abandoned mine shafts and buildings in the mountains above leading down to the town. Ice climbing looks like fun once you are comfortable with the crampons. The lodge was shutting down for the end of the season when we left. Most of the people we met as guides and staff here were seasonal workers. Even the pilots were making their last runs for the season. Yet, in the end, there are still a few brave souls who live out here year round in the nearby town of McCarthy. On our day of departure a large rainstorm was passing through, a common occurrence during my time in Alaska. Our flight in the small aircraft seemed extra turbulent due to the weather that day. Our 5 seater aircraft was bouncing, swaying, and felt like a roller coaster. I never thought I would be so happy to see that parking lot we were going to land in again. Have you been to Alaska or this park? Give us a comment below about your trek there! Sign up in the footer with your email to win prizes from us and know about all of our upcoming events!